The History of the Town of Fallsburg can be divided into two parts, one describing the town and its growth before the railroad and the other relating to the evolution in the town after the trains began running through its territory. This is part one of this story, the early settlement of the town. On March 9, 1826, the New York State Legislature passed an act establishing the Town of Fallsburg. The town was created from portions of the already existing towns of Thompson and Neversink and derived its name from the falls located there in the Neversink River. 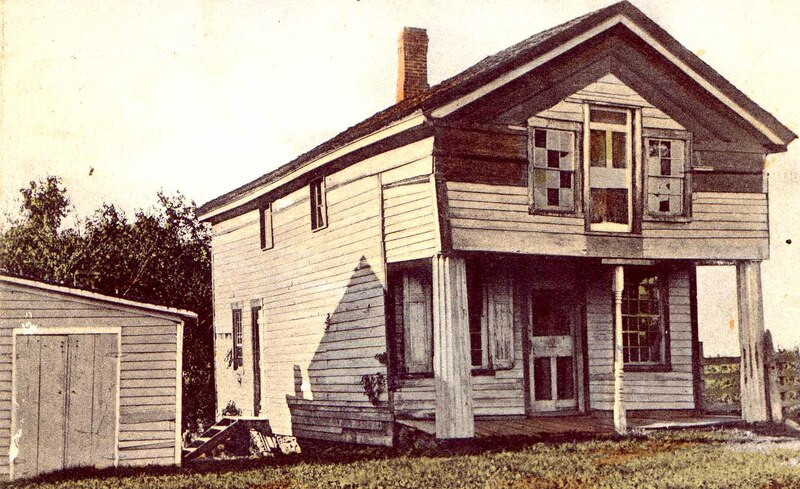 One month later, on April 4, the first town meeting was held in the schoolhouse where the hamlet of Fallsburg is today. The settlement was then known as Neversink Falls. Little is known about the earliest white settlers of the town. Their names and the exact dates they located there have not been documented, but it is thought they arrived before the Revolutionary War. They were most likely Dutch and migrated from Ulster County. They probably reached the area by using an old Indian trail that crossed the Neversink River at Denniston�s Ford near Glen Wild. Some of these settlers established a small settlement near the ford while others continued north, crossing the Sheldrake Creek, and settleing on a ridge east of Kiameshia Lake and Lake Anawana. This settlement was primarily in the Town of Thompson and was completely abandoned during the French and Indian War. A few of the settlers at Denniston�s Ford, however, were thought to have �braved it out� or only left for a short period of time. The Neversink River runs from north to south through the Town of Fallsburg and played an important part in its early development. In the late 1780�s the valley above the falls in the Neversink, between what is now Fallsburg and Hasbrouck, became known as having fertile and cheap land. This brought another influx of settlers from Ulster County. They came south from Wawarsing by way of the Chestnut Creek through Grahamsville as well as traveling north by way of Denniston�s Ford. By 1800, the upper flats along the river were pretty well settled. During the first part of the 1800�s, the region was primarily a farming community. Life at the time must have been a frugal. The long haul over the mountains to Kingston prevented a lot trade and it sometimes took as long as 90 days for mail to reach Fallsburg from Kingston. When the D and H Canal was opened in 1828 it brought a change to the area. Now the nearest outlet for their products was in Ellenville. Up until this time Hasbrouck had been the major settlement in the area. The upper Neversink River between Woodbourne and Hasbrouck was the heaviest settled because of the rich flatlands there along the river. A number of sawmills and gristmills were built there in the 1790�s further establishing the area. Hasbrouck was named in honor of Anthony Hasbrouck, a wealthy and prominent man who settled there in the early 1800�s. Mr. Hasbrouck lived in the old stone house that is still standing today. The hamlet was a major business area for many years with a variety of shops and stores and had it own post office from 1846 to 1923. The closest settlement in the Town of Fallsburg to Ellenville and the D & H Canal was Woodbourne. This unimportant settlement was soon to establish itself. Woodbourne was given its name by Gabriel Ludlam. In 1830, Mr. Ludlum had the foresight to see the advantage of Woodbourne�s location and moved himself and his law practice there from Hasbrouck. He was an ambitious man who had great ideas for the area. Although he fulfilled few of his goals, others later achieved them. Soon after the tanning industry was started in Sullivan County in 1831, a tannery was built at Woodbourne by Mr. Austin Strong. Mr. Strong went into partnership with Medad T. Morss who later became its sole proprietor. The tannery would be the center of life in the village for 35 years until it burned in 1866. 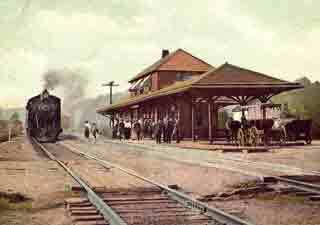 The hamlet of Woodbourne had the largest population in the town when the railroad commenced. The first tannery in the Town of Fallsburg was located at the falls. This area had been a center of industry for some time. 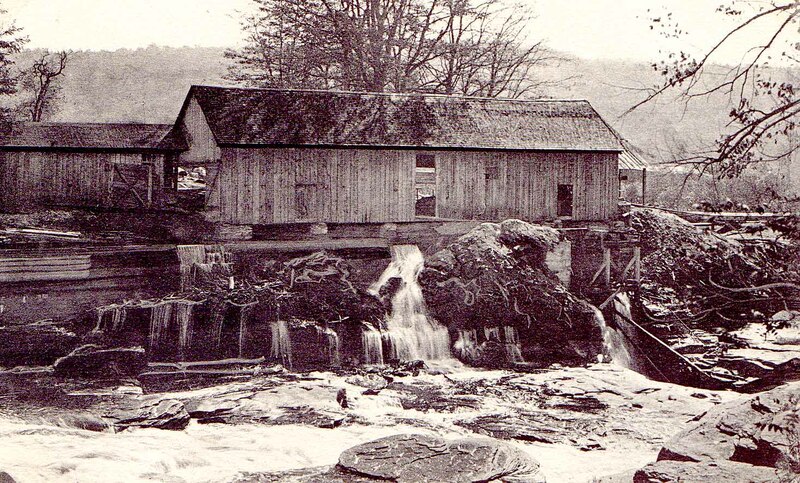 The channel and falls in the Neversink at Fallsburg provided an abundance of waterpower to run the many mills that located there. Thomas Lockwood bought out many of the early investors and builders at the falls. He owned and operated five grist and saw mills and could be considered the �Father of the Town of Fallsburg.� He not only did a lot to promote the area around the falls but also worked hard toward the establishment of the town. In fact, it was considered naming the town after him, but he declined the honor. In 1832, Rufus Palen opened the first tannery at Fallsburg. He later went into partnership with his cousin Nicholas Flagler. Palen and Flagler�s Tannery continued to operate for nearly forty years. The tanneries and other industries in the area provided a great deal of employment and made a big economic impact in the area. The portions of the Town of Fallsburg away from the river and its industries were slower to develop. In 1794, Joseph Divine came into the area from Ulster County becoming the first settler in the Divine Corners, Loch Sheldrake area. He bought a large tract of land and was the only person living in that area for several years. Although Divine Corners got off to a slow start, by 1870 it had become a prominent community. A post office was established there in 1880 that continued until 1967. Henry D. Schoonmaker arrived in Divine Corners as early as 1805. Shortly after, he bought property at Sheldrake and became so well known for his developments there that the area was first called Schoonmaker Settlement. The stream and lake there was named Sheldrake after the ducks in the area and the community at the lake later became Loch Sheldrake. The hamlet did not develop into an important area until the railroad depot opened in nearby Hurleyville. The area of Denniston�s Ford was one of the first places to be settled in the Town of Fallsburg. There were settlers already there in the 1790�s when the influx of new pioneers came up the Sandburg Trail. Many of these newcomers stayed in the area by the ford. Archibald Denniston arrived there around 1815. He came from a prominent Orange County family and the area around the ford soon carried his family name. The Denniston�s Ford area might have had an early start but the only community to develop in the region was at Glen Wild. In 1805, Johannis Miller, another influential man from Orange County, bought a large tract of land east of Denniston�s Ford. He had visions of developing his landholdings into an important village with an impressive residence on one hill and churches, a court house and other important structures on other rises in his town. Unfortunately, the Jones brothers of Monticello beat him to his dream and Mr. Miller returned to Orange County a disappointed man. Much of his real estate holdings were in the Town of Fallsburg and the area was known as Miller Settlement before being named Glen Wild. The areas of Hurleyville, Mountaindale and Woodridge were generally underdeveloped until the railroad established depots at these places. Mountaindale, or Sandburg as it was known until 1880, was the most settled area of the three. One of the original inhabitants, Steve Porter, built a house there in 1807 and was followed by many of his friends. However, the population did not grow significantly until after 1835. By the 1850�s there were four sawmills and a large tannery in the area providing considerable employment. Hurleyville was named after an old hunter, William Hurley, who was the first settler of the area. He believed the location of his property would one day be on an important route of travel in the county. However, he was mistaken and the major county roadways bypassed his holdings. His house was the only one located in the isolated area for many years. Mr. Hurley.s name remained and his vision became a reality many years later when the railroad line ran through the village. There seems to be little history to write about Woodridge, first called Centreville, before the railroad was built. It was barely mentioned in �The Gazetteer and Business Directory of Sullivan County � published in 1873 and neither Centreville nor Hurleyville was noted on an 1856 map of Sullivan County. Sullivan County was well documented in the 1870�s by three publications. Hamilton Child published a book bursting with information titled Gazetteer and Business Directory of Sullivan County, N.Y. for 1872-73. James Eldridge Quinlan�s 1873 �History of Sullivan County,� is a wordy edition full of facts and tales about the development of the county. And in 1875 F. W. Beers issued his Atlas of Sullivan County Towns and Hamlets, which showed the location of schools, churches, many businesses, and prominent landowners. It also listed the principal manufacturers, merchants and farmers of each town. However, the Town of Fallsburg described in these three works was about to change. The trains had arrived. The first train to enter Sullivan County was on January 24, 1872 when it traveled through the newly completed tunnel at Bloomingburg. The New York & Oswego Midland Railroad (later bought by the O&W) was completed on July 9, 1873, when the last spike was driven at a place called �Hell Hole,� just east of Roscoe. Sullivan County was now opened to rail service to and from New York City. To appreciate how much the railroad changed the Town of Fallsburg you must be familiar with the Town as it was in 1872. The Town needed a boost. Its once prominent tanning industry had ended. The Woodbourne tannery burned in 1866. The tannery located in Sandburgh (Mountaindale) burned in 1871, and the one at Fallsburg, one of the few that never burned, had discontinued business because of the growing scarcity of bark in the area. The population in the Town, which had grown steadily between 1830 and 1860 showed a slight decrease in the 1865 census and continued to decline according to the census of 1870. The villages located along the upper Neversink River were the largest in the Town at this time. They had developed with the farming industry and later benefited by the tanning industry and other mills located along the riverbanks. Woodbourne was the largest village in 1872 with 140 inhabitants, followed closely by Fallsburg with 130. Hasbrouck, once the largest community in the Town, was now third with 90. Loch Sheldrake and Divine Corners were forth and fifth with a population of 40 each. Notice that none of these top five communities were located along the railroad line so that when the railroad began running through the Town, not one of its depots was located in these widely settled area. According to the Child�s 1872 �Gazateer,� Centreville (Woodridge) was the most populated hamlet along the railroad line with about one dozen houses. Sandburgh had approximately a half a dozen houses and Fallsburgh Station (South Fallsburg) and Hurleyville Station were merely mentioned as stations along the railroad line. However, the growth pattern in the Town of Fallsburg was about to change. Instead of the Neversink River the railroad line would become the nucleus of Town. There was a rapid increase in population and business in the communities nearest the depots while the once promising hamlets located furthest from the train stations, like Hasbrouck and Divine Corners steadily declined. The railroad industry encouraged growth in a number of ways. The dairy farmers now had a way to transport their milk, which resulted in an extensive dairy industry in our Town. The creamery located in Hurleyville became one of the more significant ones along the O&W line. The milk industry instituted an important ice business on Alto Lake (Echo Lake) and Pleasure Lake which employed hundreds of men during the winter to cut and store the ice for the railroad�s use during the warm months to keep the milk cool. The Intercounty Feed and Grain was formed in Woodridge and provided an economic boost to the area for many years. A prosperous poultry industry also grew in the Town. The most impressive business to flourish due to the railroads was the summer tourist industry. The railroad enabled thousands of New York City residents to escape the heat of the city and travel to the widely promoted mountains and enjoy our beautiful countryside and healthy environment. By the turn of the century, many hotels had been built to accommodate the growing number of visitors each summer. The fastest growing type of lodging was the farm/boardinghouse. In the 1899 issue of the O&W publication, �Summer Homes,� there were 162 places listed to stay at in the Town of Fallsburg, most of them being farm/boarding houses. Some Sullivan County farmers had already been boarding guests before the summer tourist trade began. Sportsmen had been visiting the area for many years to hunt and fish. They would hire the local farmers as guides and many would board in the farmers� homes or stay at the local hotels that were already in existence. The earliest hotels in the area, like the Centerville House, catered to the sportsmen, advertising good guides and dogs for a reasonable price. The railroads may not have birthed the farmer/boardinghouse trade, but it certainly developed it into the tremendous business that existed here at the turn of the century. The story of the remarkable summer tourist industry in Sullivan County, especially in the Town of Fallsburg, from the boarding houses to the later large hotels and resort complexes is a story of its own and too extensive to detail here. However, I would like to note that although the railroad spawned the rapid growth of the tourist, by the 1920�s and 30�s more and more of the summer guests were arriving by automobiles or busses. The Town of Fallsburg�s big resort era of the 1940�s and 50�s had its foundation laid by the railroad, but Route 17 consummated it. Progress brought us the railroad and our resort era, and subsequent progress would cause their demise. With the invention of the automobile and the continuous improvement of the highways leading to the mountains, the O&W�s prosperity started to falter. After many years of struggling, passenger service was discontinued in 1953. As the trucking industry proved to be more versatile and economic, the train�s freight service also failed. The O&W ceased operations on March 29, 1956, making it the first major American railroad company to be abandoned. Like the railroads, the resort industry in Sullivan County was also doomed by progress. With the development of air conditioners and the advancement of the aviation industry, fewer and fewer tourists came to the Catskills. Although the hotel industry is all but gone, the area still enjoys a large influx of summer visitors. Numerous bungalow colonies are still in operation and many people have summer homes here. Countless Orthodox Jews and Hasidim return each year to bungalow colonies and old hotel and boardinghouse buildings. Human resource groups like New Hope Community, Crystal Run Village and the Dynamic Youth Center purchased many of the vacated hotels in the Town of Fallsburg. These organizations provide valuable jobs to area residents. Meditation groups bought other hotels, the largest being the Siddha Yoga Ashram that turned three unused hotels into showplaces that attract hundreds of visitors to our Town. Although some of the hotel buildings are still standing, most of the great stucco buildings that once lined our roads have been destroyed. The farming industry, including the once lucrative dairy and poultry business, mirrored the hotel industry. They prospered during the first half of the 1900�s but slowly declined during the second. There are few farmers left in the Town. Although the Town of Fallsburg is not in the position now that it was at the turn of the last century, there are a lot of positive things here. The three prisons in Woodbourne offer employment to many area residents. The Sullivan County Community College in Loch Sheldrake is expanding with dorms being built on the premises. The many new housing developments and condos being built are providing revenue to the business industry plus adding to our tax base. The Town has two beautiful golf courses and parks that draw many visitors and revenue. The Town has also been working hard to improve its appearance. The remnants of decaying hotels and bungalows that marred our countryside for many years are finally being removed restoring the land to its former beauty. The Town has recently erected an overlook in Fallsburg where visitors can enjoy the view of the falls that has been an attraction since the first white man viewed it over two hundred years ago. The Town of Fallsburg might never again attain the recognition and prosperity it enjoyed during its �golden resort years,� but it is a beautiful place to live or visit.